UR Science ROCs: What's CRISPR? It’s no secret: URMC is home to extraordinary scientific innovations and research. Our UR Broadening Experiences in Scientific Training (URBEST) program and our Public Relations and Communications office teamed up to offer our students and trainees the chance to highlight our research through original visuals and videos. Four videos earned prizes for their unique science storytelling and will be featured on our intranet site and the UR Medicine Facebook page throughout the month in an ongoing series called "UR Science ROCs." 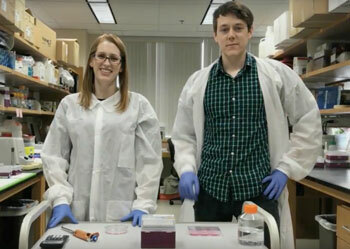 Fourth-year graduate students Chris Goodwin and Sierra Fox, and third-year graduate student Nick Nobiletti, talk about CRISPR and how it’s helping scientists edit DNA. Goodwin is a student in the lab of Joshua Munger, Ph.D.(Department of Biochemistry and Biophysics); Fox is a student in the lab of Michael Bulger, Ph.D.(Departments of Biochemistry and Biophysics and Pediatrics); and Nobiletti is a student in the lab of Angela Glading, Ph.D. (Department of Pharmacology and Physiology). Emily Boynton and Molly Miles from URMC’s Department of Public Relations and Communications met with a small group of URBEST trainees to discuss how the Medical Center and other academic institutions are sharing science in the social world we live in. They provided some examples of different types of visuals and videos that get great engagement on Facebook, Twitter and other social media sites. The goal? URBEST and The Public Relations and Communications team wanted to find and offer prizes for three original visuals or videos from students and trainees that highlight UR innovation and research. Money, video packs and fame! First prize was awarded to a team of scientists: Chris Goodwin and Sierra Fox from Biochemistry and Molecular Biology and their camera man Nicholas Nobiletti from Pharmacology and Physiology for What Is CRISPR? They split $750 of prize money.